a 70 year old female is bought to your ED at 10pm via ambulance with a dense right-sided hemiparesis following a witnessed collapse at home only 30 minutes earlier. She had apparently been well during the day and was seen to collapse to the ground whilst taking the rubbish outside after dinner. Her next-door neighbour states that the patient was alert but unable to communicate immediately after the event. HS dual. No murmurs, rubs or gallop. Abdomen soft & non-tender without palpable pulsatile masses. GCS 10/15 (E4, V1, M5) with obvious right-sided facial droop & dense (0/5) hemiparesis. No peripheral oedema. Peripheral pulses present. No limb swelling. What are your differential diagnoses in this patient ? But how do you explain the hypoxia or the shock?? But her chest is clear!! With such a diverse list of potential diagnoses, you commence resuscitation and continue your investigations…..
No PTx or intraperitoneal fluid. Following an uneventful RSI, she remains hypoxic and shocked. What are you going to do now ??? This critically ill lady has features of a simultaneous acute stroke plus massive pulmonary embolism !! She is too sick to move from your resuscitation bay and you do not consider it safe to transfer her to radiology for advanced imaging. Given this challenging clinical snookering you decide to administer empiric intravenous thrombolysis (alteplase) based on the likelihood that this is most likely a thrombotic aetiology. 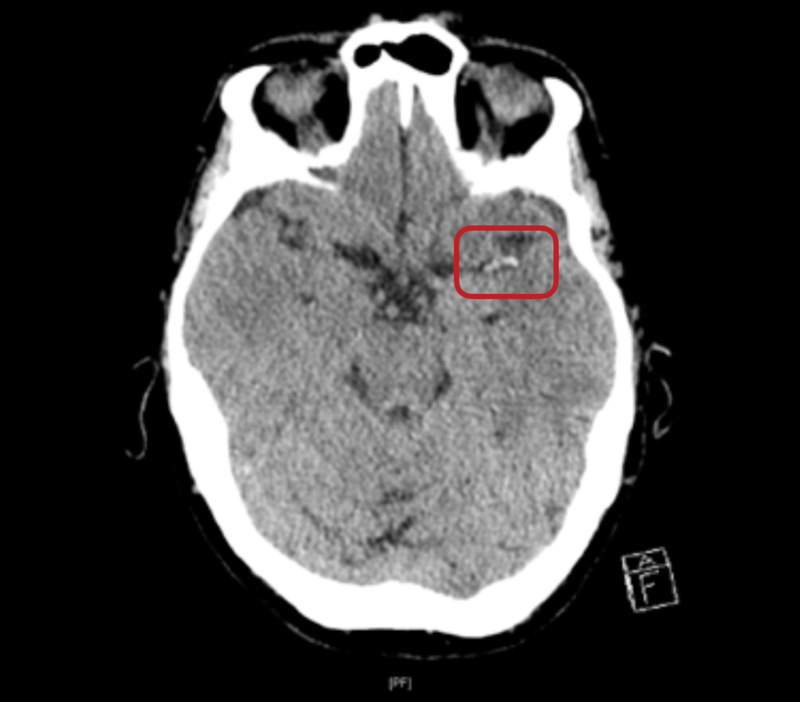 There is a hyperdense left MCA (at M1/M2 junction) consistent with acute thrombosis. There is acute infarct involving the insular cortex and frontal operculum. Multiple segmental and subsegmental pulmonary emboli demonstrated bilaterally. There is minor reflux of contrast into the IVC and the right ventricle is prominent in keeping with a degree of right heart strain. Paradoxical embolism refers to the clinical phenomenon of thromboembolism originating in the venous vasculature which traverses through an intracardiac or pulmonary shunt into the systemic circulation. Paradoxical embolisms have been documented in medical literature as far back as 1877. These result from a venous thromboembolism that transits from the right- to the left-sided cardiac chambers. They may occur via interventricular or interatrial defects, or via pulmonary arteriovenous malformations. Of the 500,000+ strokes per annum in the United States, a cause remains unidentified or unproven in 40-45% of cases despite comprehensive diagnostic workups. These strokes are known as cryptogenic strokes. The most common cause of cryptogenic stroke is probably paradoxical embolism due to a patent foramen ovale (PFO). Normal foetal circulation is dependent on the foramen ovale, which provides a communication for oxygenated blood flow between the right atrial and left atrial during lung maturation. At birth, decreased pulmonary vascular resistance and increased left atrial pressure promote closure of the foramen ovale. Whilst PFO’s are found in ~27% of the general population, their incidence is much higher (OR 2.9) in patients with cryptogenic stroke. The annual risk of cryptogenic and recurrent stroke in PFO populations is 0.1% and 1%, respectively. The precise mechanism of stroke in patients with a PFO is unresolved. Under physiological conditions, a pressure gradient is maintained between the left and right atrium, which results in passive closure of the PFO. 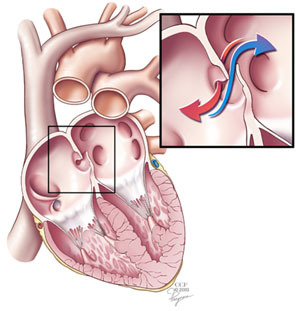 In the case of increased right atrial pressure exceeding left atrial pressure (as observed at the end of Valsalva manoeuvres such as coughing, sneezing or squatting) a transient right-to-left shunt may occur carrying particulate matter such as thrombi into the systemic circulation. 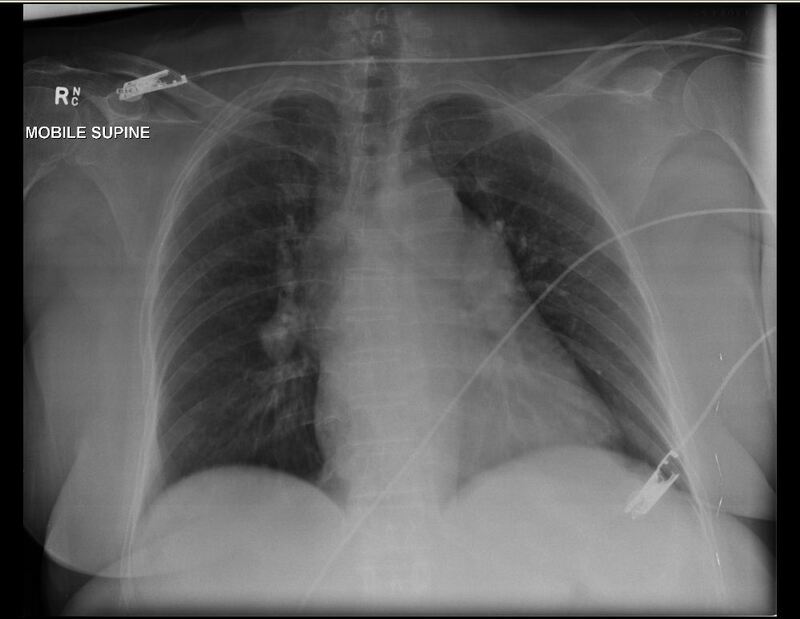 A permanent increase in right-sided cardiac pressures, as observed after pulmonary embolism or other causes of pulmonary arterial hypertension, results in a significant and possibly permanent right-to-left interatrial shunt, thereby increasing the risk for paradoxical embolism. The clinical diagnosis of paradoxical embolism requires a venous source of embolism, an intracardiac defect or a pulmonary fistula and evidence of arterial embolism. Depending on the site of embolisation, paradoxical embolism may result in neurological deficits related to ischaemic stroke, chest pain and ECG changes indicative of myocardial infarction, acute abdominal pain from mesenteric ischaemia, back pain and haematuria as a result of renal infarction, or cold and pulseless extremities secondary to peripheral arterial occlusion. 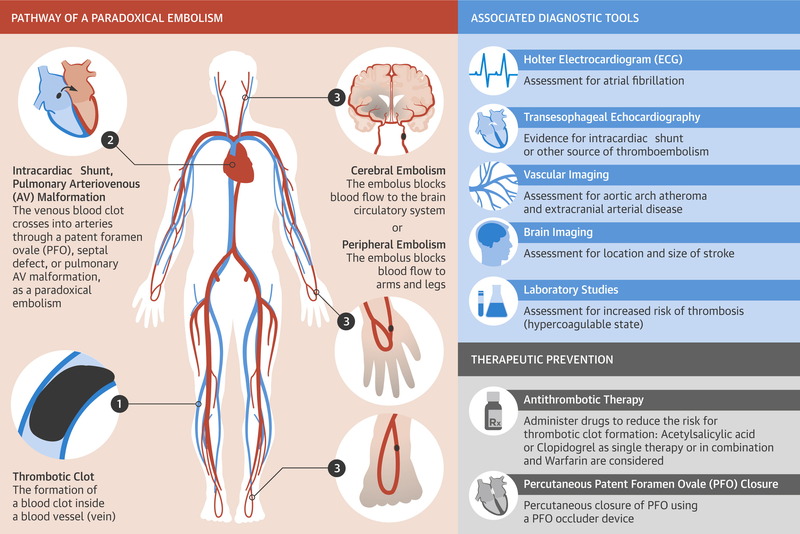 Paradoxical Embolism: Pathophysiology, Diagnostic Tools, and Prevention Image courtesy of J Am Coll Cardiol. 2014;64(4):403-415. The formal diagnostic evaluation required in patients with cryptogenic stroke will far exceed any Emergency Department length of stay. However, in patients with cryptogenic embolism and a coexisting intracardiac communication at the atrial level, the presumptive diagnosis of paradoxical embolism should be seriously entertained. Transthoracic or transoesophageal echocardiography are the diagnostic method of choice for the noninvasive detection of intracardiac shunts and a patent ductus arteriosus. It also allows clinicians to assess the size of a defect and provides information on shunt quantity and direction. Accurate PFO detection requires peripheral injection of agitated saline or echocardiographic contrast medium at the end of a sustained and rigorous Valsalva manoeuver. The echo criteria for PFO diagnosis include the early detection of contrast microbubbles in the left atrium within 3 cardiac cycles after opacification of the right atrium (see below). Transthoracic echocardiography showing contrast medium passing through the patent foramen ovale. Image courtesy of Rev Esp Cardiol. 2011;64:133-9. Transoesophageal echo (TOE) is considered to be the “gold standard” technique for the diagnosis of right-to-left shunts, however the use of sedation to facilitate the study often reduces the performance of Valsalva manoeuver. Keep in mind however that the sensitivity of transthoracic echo (TTE) may be as low as 63%. These include transcranial doppler sonography, computed tomography and cardiac MRI. Antiplatelet therapy (aspirin, clopidogrel or a dipyridamole) is first-line in the secondary prevention of systemic paradoxical embolism. 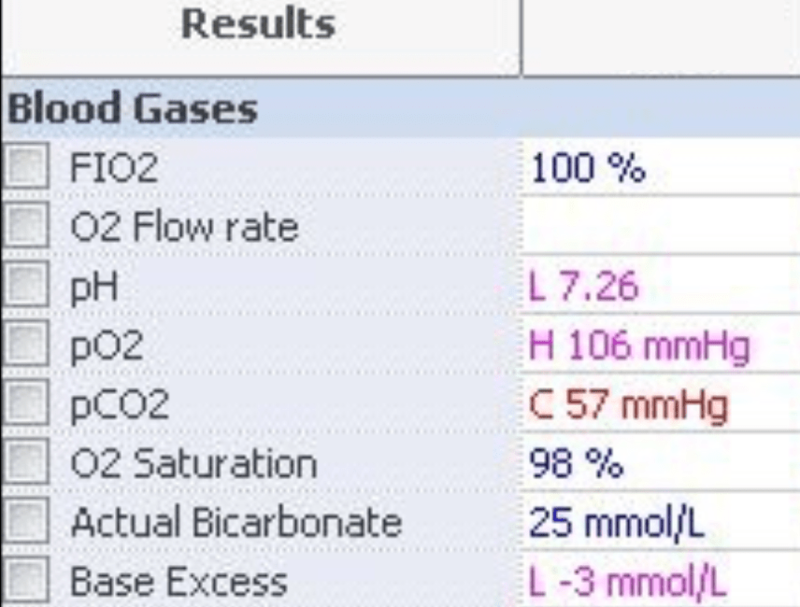 Further anticoagulation with heparin, LMWH, warfarin or rivaroxaban etc is indicated for cardioembolic disease and in the presence of concomitant pulmonary embolism. Percutaneous closure of cardiac septal defects is frequently performed however evidence supporting this practice is inconclusive when compared to medical therapy alone. The patient is transferred to the intensive care unit on minimal vasopressor support. 24 hours into her admission she has a formal transthoracic echo (whilst still intubated and sedated) which demonstrates normal LV and RV size and systolic function. Her pulmonary pressures are normal and there is no evidence of intracardiac shunt on a bubble study. A cause was never found for her paradoxical embolism, but one is left to ponder whether the acute pulmonary hypertension caused by a massive pulmonary embolism was enough to drive a transient right-to-left shunt resulting in her subsequent ischaemic stroke. Poole-Wilson, P. A., May, A. R., & Taube, D. (1976). 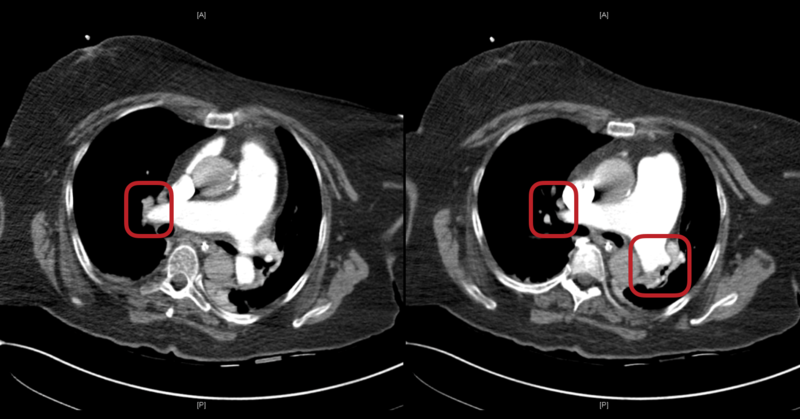 Paradoxical embolism complicating massive pulmonary embolus. Thorax, 31(3), 354–355. How can you conclude the case with out explaining How a Left MCA thrombosis presents with LEFT hemiparesis???? Thanks for pointing out this anatomically incorrect error. You are spot-on. This was merely a ‘typo’ in the case right up. The patient had right sided weakness. I have made the appropriate correction.